Many people have presented their opinions about this article (see discussion on Elfling on September 5 and 6, 2001). For some of us it is very controversial. Nonetheless you can read there not only about us, the Tolkienian linguists, but also about the Fellowship of the Ring movies, fantasy games, books about Middle-earth, and about Professor Tolkien. 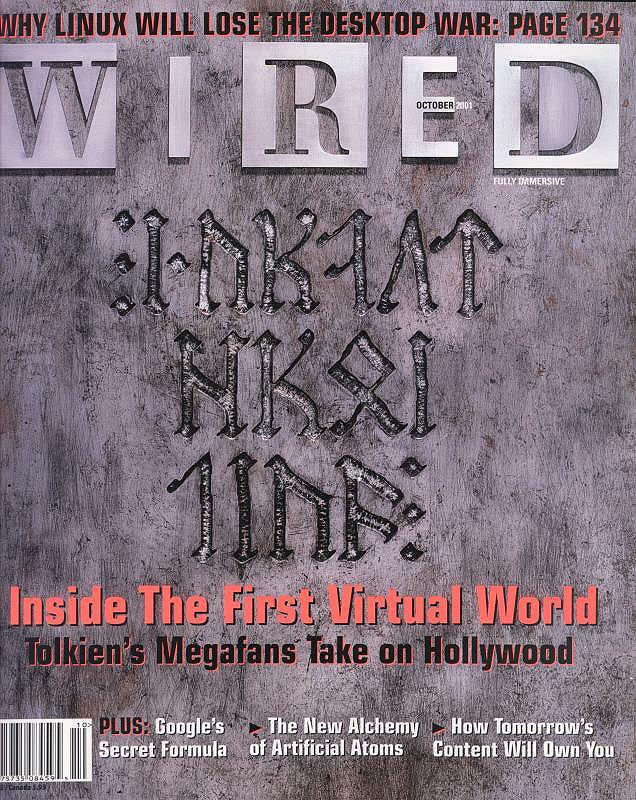 David Salo, who, as Eric Davis writes, "has to publish his 366-page analysis of Sindarin", prepared for the Wired a short Sindarin phrase displayed in cirth runes on the October 2001 cover (see above). 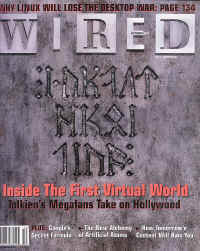 It reads: I Ardhon Erui Thiad and it means 'The First Virtual World'; the word *thiad 'virtual' is especially interesting. It is David's reconstruction which is based on the stem THE- (LR 392). Nancy Martsch, the editor of Beyond Bree found a very interesting article in New Times Los Angeles (April 1925, 2001). Elf Discovery: The Elves are speaking by Glenn Gaslin tells about Marcus Smith (left) and about the other Tolkienian linguists all over the world. Mr. Gaslin writes that we are widespread, well organized, passionate, quiet and very, very serious. The landscape of Tolkienian linguistics includes scholarly journals, dictionaries and source books (many of them contradictory), societies, fellowships and schools. If you want to read more see here. You can visit also Marcus Smith's website. Newest issue of Amon Hen (#171), the bulletin of the Tolkien Society contains an interesting article by Michael Kennedy entitled Tolkien and Beowulf: Warriors of Middle-earth (pp. 15-16). Author enlists all the Old English (or 'Rohirric') words and names that occur both in Beowulf and in The Lord of the Rings giving their reference and definitions. A very interesting text which can be compared with adequate fragments of An Introduction to Elvish by Jim Allan (see chapter The Giving of Names on pp. 185-228). The bulletin contains also a small announcement about our website where you can read: This website can be a very good start into Elvish linguistics for every interested member of Tolkien Society. Thank you, dear Amon Hen! Helge Kåre Fauskanger, webmaster of Ardalambion has published his 19th lesson of Quenya today. At www.uib.no/People/hnohf/qcourse.htm you can read about Quenya pronouns in imperative phrases, emphatic pronouns, postpositions and about question-words like man, mana, manen. Helge's course is the most up-to-date source of the information about Quenya. Gwaith-i-Phethdain recommends it warmly. A laita Helge! Lisa Star, editor of Tyalië Tyelelliéva has recently added new contents to her website. The most important part is the List of Unpublished and Slightly Published Manuscripts. You can read there about the Tolkien's linguistic papers published in the rare linguistic journals etc. Lisa informs that the next issue of Tyalië Tyelelliéva will contain texts about Sóval Pharë (or Common Speech). She promises too that the next Elvish Language Poetry Prize is planned to be awarded in Spring 2002. Lisa is an author of the interesting Qenya/Quenya translation of one very early text by J.R.R. Tolkien. Her text was published recently on ELFLING. Its Rúmilian transcription can be found on Lisa's website. Below I present its reproduction. New terrific news from the films. Read about Gimli speaking Khuzdûl and look at an Elvish dialog between Haldir and Legolas! [More]. A lot of news from the movie! We know more about Sindarin in the film, we can see the tengwar Sting's Inscription and we can read about a big Maori choir singing in the languages of Middle-earth. [More]. Attention! The Elvish Linguistic Calendar has its second corrected edition. Now you can see all the Fëanorian numerals with their Arabic counterparts. This change is a result of suggestions of all these who like Per Lindberg saw the sole Fëanorian characters inconvenient to read [Download]. All of you who have bought my Sindarin Dictionary can now download the newest list of omitted and new Sindarin words. I have added a very detailed etymology of every new word [Download]. A very sad news. The Ring Master for the Ungwecorma Ring has decided to delete his Ring. It is a great pity. Maybe somebody would like to create a new linguistic webring? Newest Vinyar Tengwar number 42 has been already sent to its subscribers. It brings new material concerning Elvish languages: especially the numbers and the negative forms in Quenya. Read two reviews of this issue: one by Ryszard I. Derdzinski and the second by Helge K. Fauskanger (published on ELFLING list). Good work Mr Hostetter! Gernot Katzer from Austria has revealed new Sindarin phrases from the movie dialog list. In message 40.00 on the tolklang list he said: Having written a few German essays about Tolkien and tengwar usage on the web, I was recently contacted by the person responsible for the translation of the LotR film into German. He asked me about some Sindarin sentences that seem to appear in the move, about their correct pronunciation and their meaning. You can see my analysis of these phrases here. 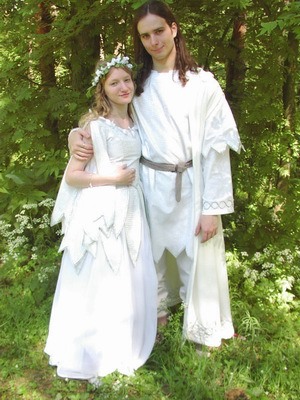 On June 16, 2001 Elenhil Laiquendo (Boris Shapiro) and Elgaladna Findilauriel (Olga Kukhtenkova) got married in a catholic church in Russia. Boris is an amateur linguist and a beginner lambengolmo. He is fond of Tolkien and his languages and he specializes (to a certain extent) in Quenya and in Middle-earth calendars; he has complex ideas about Tolkien's world and Christianity and the Elder Days of our oikoumene; his beloved, Olga is an artist, a dramatic actress, a theatre costumier, she loves drawing fairies and elves and illustrating Tolkien, she also specializes in the history of arts and culture and loves mythology and collects cosmogonical mythos. They both are elves: his name is Elenhil Laiquendo and her one is Elgaladna Findilauriel. Here you will find more photos and a wedding invitation made by Olga and Boris. As Elenhil wrote the wedding celebration was wonderful! We had several friends fond of Tolkien, but the rest were regular mortals, but at the end they all told us that when we had caught them in the circle of dancing Elves, we made them forget who they were, what other problems and things to do they had, we made them forget about the time outside and made them wish to become Elves too. Nai eleni siluvar cuileccanna Elenhil ar Elgaladna! Gwaith-i-Phethdain has a special gift for all its guests and friends! Midyear's Day in the Shire Reckoning is our June 23, 2001. It is a good occasion to present you the Elvish Linguistic Calendar [WinZip file, 2598 KB] which covers the period from spring 2001 to stirring 2002. Today you can download it for free!. The calendar contains 8 short texts in Quenya with commentaries, the 'reconstructed words' dictionaries and seasonal Quenya glossaries. You can find there also the Foreword explaining the Elvish numerals and all the calendar arrangements together with the Note on the Calculations by Boris Shapiro (Elenhil Laiquendo). Click the picture and enjoy! Advised by Helge K. Fauskanger and another competent people I have decided to change the name of this website to Gwaith-i-Phethdain with no assimilation of th > d. It is correct if we think of this name as a compound peth 'word' + -dan, pl. -dain 'craftsman, smith' (basic form tân). Gwaith-i-Phethdain is similar in its shape to Gwaith-i-Mírdain 'People of the Jewel-smiths' (S 324, 378), name of the fellowship of craftsmen in Eregion, greatest of whom was Celebrimbor, son of Curufin. It can be also written Gwaith i·Phethdain. I will appreciate when you change your links if you have your own websites! Do you have any comments? Vinyar Tengwar is a journal devoted to the scholarly study of the invented languages of J.R.R. Tolkien. Its editor, Carl F. Hostetter informs that the next issue of Vinyar Tengwar will feature the publication of the extensive, unpublished portions of Tolkien's late philological essay on the “Rivers and Beacon-hills of Gondor” from 1969! Fragments of this interesting text were published by Christopher Tolkien in Unfinished Tales, chapter Cirion and Eorl and the Friendship of Gondor and Rohan (see especially p. 319, note 31). We can expect new Sindarin vocabulary! An editorial information on the next issue of Vinyar Tengwar you can find at www.elvish.org where Carl F. Hostetter writes also on our website! Visiting this website of Elvish Linguistic Fellowship you will find necessary information on the subscription of Vinyar Tengwar. Thanks to the server change our website is visited more frequently. Since May 19 you can observe a big increase of the visits. Thank you dear Friends, all dear Lambendili and Lambeñgolmor! On the other hand I have a small request. The Internet charge is terrible in Poland and frequent updates force very big costs. If you like my website and you want to send a small financial support to Gwaith-i-Pheddain write to me. Thank you! Arkadiusz Kubala, a Tolkienian linguist and illustator from Poland whose medieval Anglo-Saxon calligraphy of one of the J.R.R. Tolkien's texts can be found here, presents his linguistic riddle. 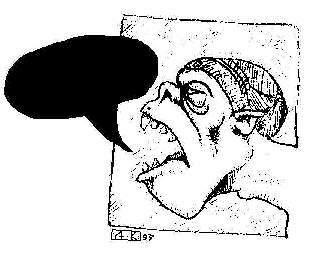 His rebus was solved by Aidan Grey - answer is "Black Speech". Aidan has won a booklet Three Elvish Compositions! A laita se! The right answers were given also by Johan Winge and Andróg. Thanks for attention! The last issue of Beyond Bree (May 2001), a magazine of Tolkien Special Interest Group of American Mensa, informs that in Seven: An Anglo-American Literary Review (vol 17, annual journal of the Marion E Wade Center) Arden Smith and Patrick Wynne published their article about Tolkien's interest in Esperanto. We hope to review this article on Gwaith-i-Pheddain soon. In all likelihood, there are some thousands of Tolkien fans around the world who, like the herb-master in the Houses of Healing, “know somewhat of the Valinorean.” You can see all the Ring Verse in Sindarin by Ryszard Derdzinski here. I like the words of Ostadan about the stereotypical conlang students: The stereotypical Esperantist is a slightly naïve idealist who sees Esperanto as a way of increasing the brotherhood of mankind through improved communication, and tries to correspond with pen-pals in as many countries as he or she can. The stereotyped student of Elvish is inspired by a language in which one routinely says things like, “a star shines on the hour of our meeting,” and may write Elvish poetry filled with natural imagery about oceans, forests, trees, rivers, and clouds. The Klingon speaker enjoys the dark irony of a language in which the standard greeting translates as, “what do you want?” and even “I love you” is expressed in a guttural phrase like qamuSHa'. And in the notes: If you really like stereotypes, the Esperantist is a 1940s-style leftist; the Elvish scholar is a 1960s hippie, and the Klingon speaker is a biker in black leather. In spite many of us are not 1060s hippies the essay by Ostadan should be read by every Elvish scholar. 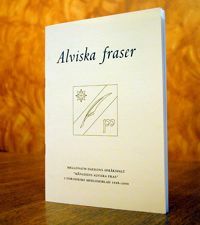 Mellonath Daeron or the language guild of Forodrim, founded in 1972, in the beginning of this year published a very interesting and nice-looking booklet entitled Alviska fraser ('Elvish Phrases"). These 25 pages edited by Per Lindberg (Gildir) and designed by Måns Björkman (Elerosse) contain analysis of all the Tolkien's shorter texts in Quenya or Sindarin. And more! On page 23 we can see the Bruinen Spell composed by the language specialists of Peter Jackson's The Fellowship of the Ring movie! This interesting Sindarin phrase is analyzed by Per Lindberg. You can see it also here. We recommend this wonderful publication being another long step towards full uderstanding of the J.R.R. Tolkien's languages! In spite it is in Swedish it is understandable to every Tolkienian linguist. I want to thank Per Lindberg, Chairman of Mellonath Daeron (Herdir o Mellonath Daeron) who was so kind and sent me a copy of Alviska fraser. 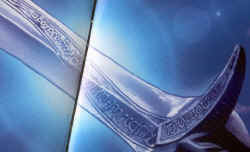 More information about the booklet you will find at the Mellonath Daeron website. Helge Kåre Fauskanger has published recently a very interesting review of the J.R.R. Tolkien's Qenyaqetsa (known also as the Qenya Lexicon) on his splendid linguistic website Ardalambion. 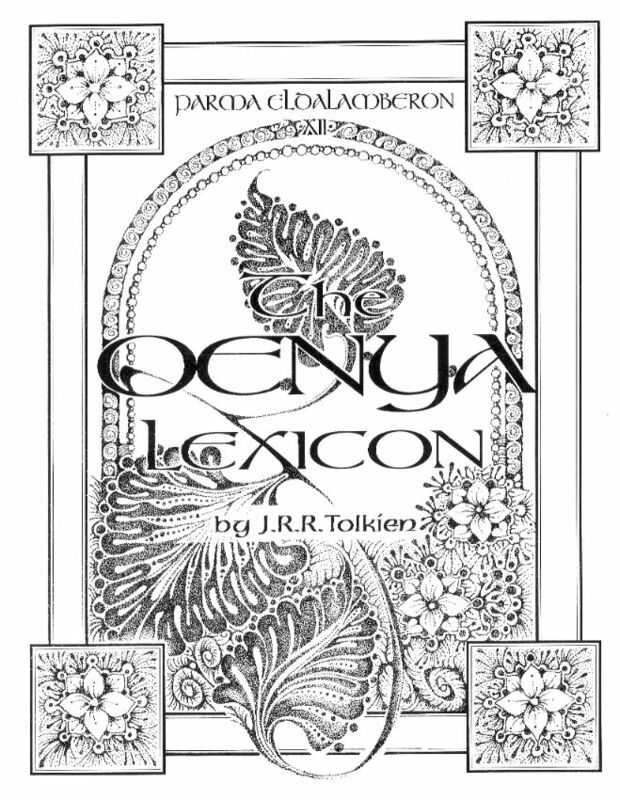 The article entitled The Qenya Lexicon Reviewed is an analysis of the Tolkien's lexicon of Qenya (which was ancestor of Quenya found in the later books and papers) edited by Christopher Gilson, Carl F. Hostetter, Patrick Wynne and Arden R. Smith and published in 1998. The article by Helge is a slightly revised version of an article that originally appeared in Tyalië Tyelelliéva #14. 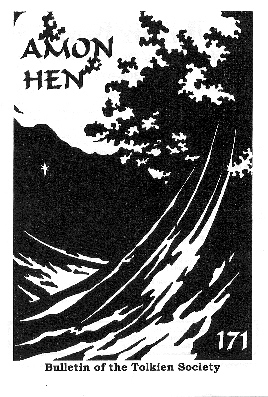 Helge begins his article with these words: Originally written in 1915, the Qenyaqetsa or Qenya Lexicon documents the beginnings of Tolkien's development of High-elven - a process that would go on for decades before LotR-style Quenya was reached, and in one sense not ending before it inevitably ceased with Tolkien's death. Organized by "roots", somewhat like the Etymologies, the Qenya Lexicon contains well over 3,300 Qenya words. (One estimate by the editors, "over 2,500", is technically correct but far too conservative.). Thanks to Helge we can compare the primitive forms of the Qenyaqetsa with the so called 'mature' Quenya. Helge shows us also the lexical richness of this interesting book. At the end he asks: "Is this information valid for LotR-style Quenya?" We must hope that the Qenya and Gnomish Lexicons have not been completely forgotten when Tolkien's later writings on Elvish are finally made available to scholarship. The new text by Helge Fauskanger is a very good linguistic analysis. You should read it in full! ".......and Lord Of The Rings is premiered on the Riviera...well kind of." The screen changes to show Liv Tyler standing in front of the castle where the party was held, dressed in black. She begins to speak elvish! I think it sounds somewhat similar what she said on the Conan O' Brien show a few weeks ago [...]. The reporter asks her what does it mean, to which she grins and says, "I'm not telling." The recorded phrase and its analysis can be found here. 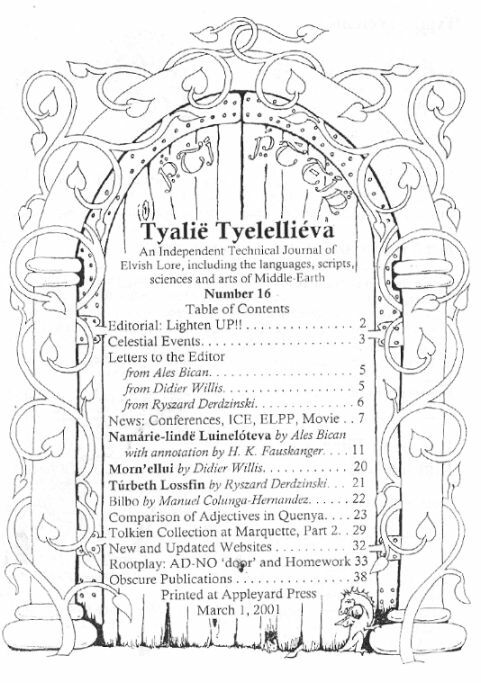 In March 2001 Lisa Star published the 16th issue of Tyalië Tyelelliéva. This issue contains a very interesting article by L. Star entitled Comparison of Adjectives in Quenya. It is an analysis of the Qenya adjectival forms found in a mysterious document called by Lisa the CB Grammar. The CB Grammar seems to be a collection of the J.R.R. Tolkien's unpublished sketches and texts found in a manuscript collection. What the 'C.B.' acronym means and which collection the adjectival forms come from we still do not know, but we hope to find it out soon. It is possible that 'CB' is 'Collection of the Bodleian [Library]'. The newest Tyalië Tyelelliéva contains also few Elvish compositions by Ales Bican, Didier Willis and Ryszard Derdzinski (see here), some news about Iron Crown Enterprises and about the LotR movie, a review of the Måns Björkman's Sarati Software Font and The Tolkien Collection at Marquette, Part 2 reported by Lisa Star. For the subscription information of the Tyalië Tyelelliéva email or send a snail-mail letter to Lisa Star: P.O. Box 1001, Eugene, Oregon 97440, USA. Julian Bradfield, an editor of the long-absent linguistic magazine entitled Quettar, being published in the UK in 1980s and 1990s, is going to revive it! 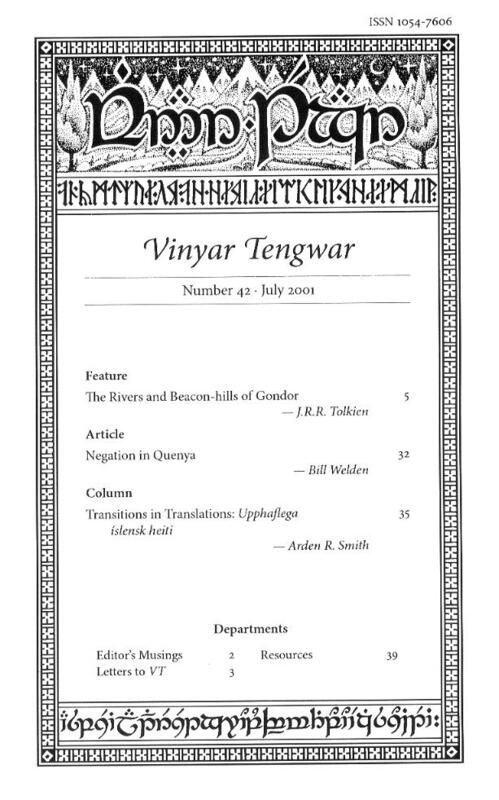 Quettar together with Vinyar Tengwar and Parma Eldalamberon was one of the three main Tolkienian linguistic magazines in the beginning of the last decade. As Julian Bradfield says: Quettar died mostly because nobody wrote anything for it, and because I made no effort to make people write things. (...) The hard bit is the material! In April 2001 Julian proposed Ryszard Derdzinski to revive together this legendary magazine. They plan to gather best linguistic texts, Elvish compositions, interesting reviews and good artwork and they ask you all for your help. If you want to take part in this undertaking or if you want to comment it write to Ryszard Derdzinski. As Harri Perälä wrote in his message on the elfling list, in a recent TV interview Liv Tyler gave an example of a Sindarin phrase that will apparently appear in The Lord of the Rings movie. See and hear this interesting Sindarin phrase here. Any comments? Many of you have informed me that you had many problems connecting with this website. Gwaith-i-Pheddain is placed on a server in Poland where the Internet works very slowly. The situation becomes better and better, but many of you have to spend a lot of time to download something or to see the newest actualizations. I have asked you to help me to find a good server outside Poland. In April 2001 Carl F. Hostetter, an editor of Vinyar Tengwar and a good friend of Christopher Tolkien, proposed me to place my website on his hospitable server. Since June 2001 the new address of the Gwaith will be www.elvish.org/gwaith, but the old version of the website (as well as the Polish version) will be still available under the old address. If you have any comments write to me.